New Site Features: Shoe Width and Weight! In an effort to provide answers for two of THE MOST asked questions I see on this site and boards across the net, I've added two new specifications under the "Shoe Features" section of each review. As the title exclaims, these will be Shoe Weight and Shoe Width - Now the next time you see someone ask "How much does the weigh?" you can refer them to the review page. Launching nearly simultaneously with the Adidas AdiPower Weightlifting Shoe, the Nike Romaleo 2 shoe already has a few noticeable advantages over its competition - namely color options! What changes have Nike reps stated will be made to the new Nike2 shoe and will there be enough stock to go around on the 15th of January when these official launch? Adidas AdiStar’s Back in Stock! I just received an email from Adidas announcing that they now have a full stock of the AdiStar Oly shoes available on the ShopAdidas site. While there are several new models of lifting shoes (including some from Adidas) on the verge of being released, if anyone has been waiting on these to be back in stock now is your chance! Will Rogue Fitness Stop Selling Do-Wins in 2012? 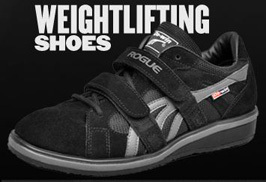 Rogue Fitness has always been a cornerstone of Crossfit equipment, not the least of which has been their popular weightlifting shoe. But with the advent of the Reebok Crossfit shoes, Rogue's own decision to carry other brands, and the mounting complaints about Do-Win quality - Will Rogue Stop Retailing the Do-Win Badged Shoes? VS Xplosion II Weightlifting Shoe for $39? Released in October of 2011, the VS Xplosion 2 shoe appeared on the market as one of the cheapest pairs of shoes available by a known manufacturer. We found that the $39 price tag was too good to be true and this model is actually a batch of factory rejects with numerous possible issues.